Genestar™ is a registered trademark for the innovative and proprietary polyamide resin (PA9T) developed from unique C9 monomer, manufactured and marketed by Kuraray. In comparison with other polyamides, Genestar™ PA9T is a well-balanced polymer that can improve the performance of your products. Genestar™ PA9T is commonly used in SMT applications due to its good blister resistance, good dimensional stability and low moisture absorption. It is often used in electronics applications for switches, camera module housing and various types of connectors such as USB, DDR, board-to-board, wire-to-board and FPC. It is also widely used in LED application for lighting of smart phone, tablet, notebook, LED TV and lighting. 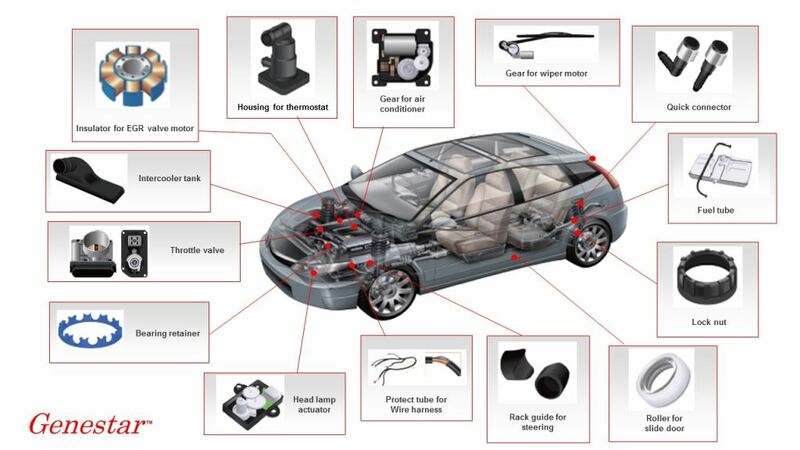 It is also gaining market share in automotive industry for metal replacement due to its excellent chemical resistance, high crystallinity and high heat resistance, and replacement of other polymers due to its good mechanical properties, high heat resistance and ease of processing. To obtain the best results in the products using Genestar™, guidelines on the injection molding parameters can be provided upon request. For more information, please visit www.genestar.jp/en/.